Second album containing 19 tracks unseparated by pauses for the first Grind band using horns in a massive way. The beginning is ultrafast with "Vivacious", including an intruder Death Metal riff, but already from the third song "Click.Boom." saxophone insertions and Ska structures appear; the problem is that they're too happy and cacophonically avulsed from the rest, especially in this genre. "Pig Named Pompadour" is one of the best tracks along with the Death/Grind "Lascivious Undead Concupiscence", whereas "How You Destroy" has a nice main riff and the horn contribution is finally well chosen and incisive. Although the album is mostly Punk/Grind there are tracks such as "Maaht der Maschine", that sound more Metal than the others. Like the title suggests, "Matt Is A Hobogoat" is a weird composition, while "Bringing Back the Curly Mustache" has good and bad sides: the positive aspect is mainly the cool riff, but the song is ruined by a sloppy drum performance which repeats in "Christvice". I have to spend nice words on "Drown This Town", due to its blend of slow and tight parts, and on "Stutz, What the Hell? ", a ferocious Crust track, and decidedly the record's highlight together with the long, elaborate, guttural and slamming "This House Shall Kill Me Yet". 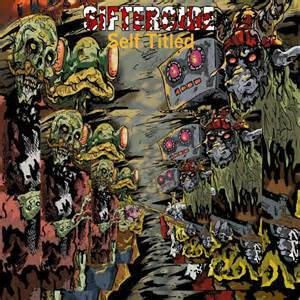 Siftercide is the typical case of a combo with a great deal of potential that landed a deal too early; more focus will be necessary on the next album in order to use Ska and horns not only to claim originality but also to use them as an efficient resource to stand out the mass of Grind acts.